Years in the making! IF247 Tip Up Flags! Add some bling to your tip ups or replace tattered, faded flags with some brilliant orange ones bearing the IF247 logo. GO TEAM! We have IF247 Bumper Stickers!. They are 10" x 3", snow white with black lettering. 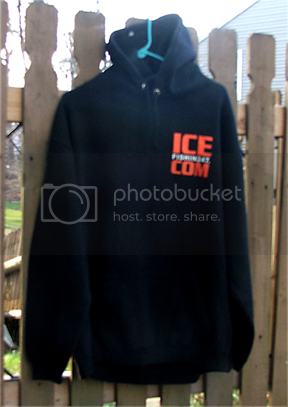 They have IceFishin247.com with our "Have an Ice Day" $5 for 2 One for your car and one for yoiur sled. shipping included. NEW! this Year..... IF247 T-Shirts! available in XL and XXL $15, + $4 Shipping. 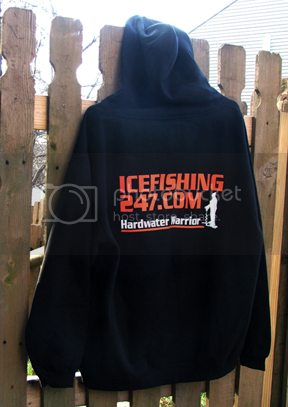 Want one of our HardWater Warrior Hoodies? $30 + $5 to ship. Page created in 0.356 seconds with 15 queries.